ierre-Anniviers is one of the Alps greatest secrets. The resorts are largely unconnected, apart from a new lift between Grimentz and Zinal, and the roads are tortuous (especially the road up to St Luc and Chandolin). 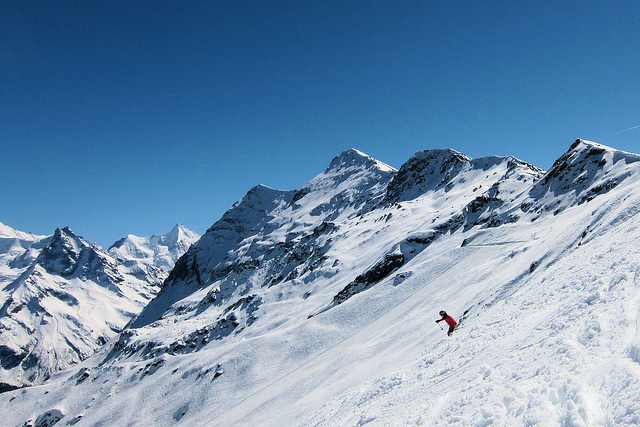 However the reward includes largely empty pistes and bags of great off-piste. Vissoie lies at the centre of the resorts and probably makes the best base to explore all the area, but Sierre itself is a bit livelier and also gives good access to Crans-Montana via a funicular railway as well as being, by reputation, the sunniest place in Switzerland. Typically you can get from Sierre to Grimentz in about an hour, changing to a connecting bus for the resort in Vissoie. Vercorin, the smallest of the resorts of Val d'Anniviers, is closer and can be reached by a cable car from Chalais, itself only 12 minutes by bus from Sierre. The whole valley is full of some classic runs, personal favourites being the run off Bella Tolla down to the bottom of the St-Luc Funicular Railway, and the run off Zinal all the way down into Grimentz. The restaurant Didier de Courten has two Michelin stars and is located right in the middle of Sierre (Tel +41 027 455 13 51). The road distance from Zurich is around 309 km and the journey time is roughly 3 hrs 25 mins. The road distance from Basel is around 282 km and the journey time is roughly 3 hrs 10 mins. The road distance from Berne is around 187 km and the journey time is roughly 2 hrs 10 mins. The road distance from Geneva is around 193 km and the journey time is roughly 2 hrs 15 mins. 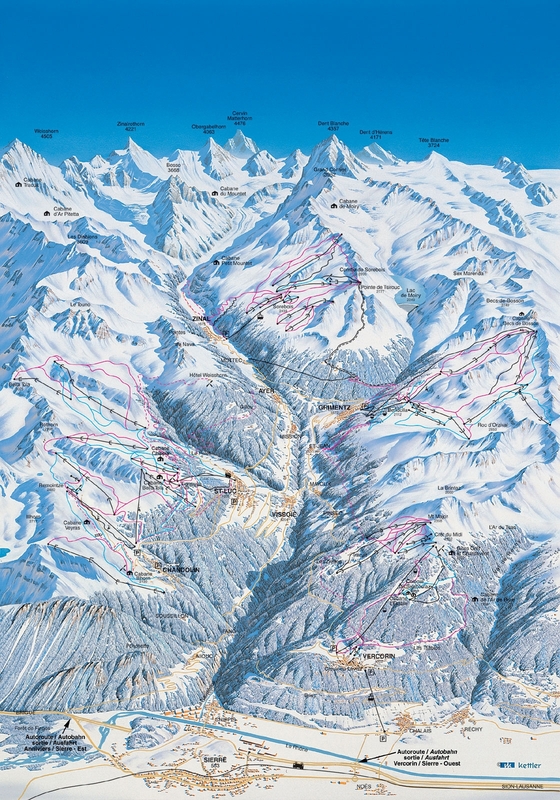 Resorts in the ski area include Grimentz, Chandolin, St-Luc, Vercorin and Zinal.